Enjoy a feast of grilled filet of wild Alaskan salmon along with baked chicken, rice pilaf, and a variety of salads, baked beans, cornbread, coffee, lemonade, and dessert! 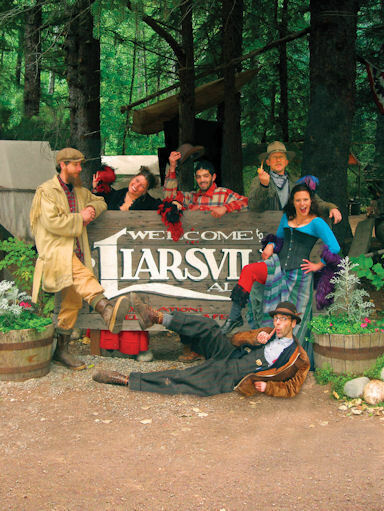 After lunch, wander over to camp and enjoy the waterfall and authentic exhibits of Liarsville. Here a cast of sourdoughs and dance hall girls will entertain you with a hilarious melodrama and a poem by the "Bard of the North", Robert Service. They will even teach you the art of gold panning! Then, you will be set free in the Liarsville gold fields, where you are guaranteed to find that precious metal that drove men and women wild with gold fever! Have your picture taken with one of the dance hall girls or the camp's lovable mascot, an Alaskan Malamute named Denali. Beer and wine are available for purchase. Some final notes: bring your vouchers and dress comfortably for the weather (if your tour is on the water it will be about 10 degrees cooler.) Camera and binoculars are suggested for land-based tours. However, while on tours involving rafts, canoes and kayaks, we suggest you bring disposable cameras.